With someone else’s money burning a hole in my pocket and a five year old motorbike in the garage, I decided the time was right to test ride a new bike. When I sold my R12GS some years ago I had grown bored of the flat twin engine, but not the style and concept, and always said a similar bike with a four cylinder engine would tweak my interest. The XR is just that, and was launched to much fanfare back in June and was, apparently in very short supply, with huge numbers of preorders based on the concept alone, as opposed to test rides. Enthusiastic magazine reports only increased that demand, as journalists from all over the world decided this was the best bike since the last best bike. Perched above some of the stumpiest legs on the planet, I was a little wary of the XR’s height, but the one I was given at Wollaston Motors in Northampton, apparently had a lowered chassis and reaching the ground was easy, even if I was still on tip toes. After subsequently sitting on the standard height machine, I am unconvinced the bike I was on was the low version, however. Whatever, the GS has similar seating options and I found it too low, compromising comfort and handling; the XR had no such issues. The feeling of extra height could well be due to the seat, which is flat, firm and wide, spreading the legs. It is comfortable though, and despite the sculpted feeling there is plenty of room to move about. The position reminded me of the GS, the wide bars, relationship between saddle and pegs coupled with the adjustable screen, handguards and heated grips all make this a comfortable, day long ride. Despite my somewhat precarious position, the bike is perfectly balanced, and smooth predictable fuelling made negotiating the cluttered bike park easy. 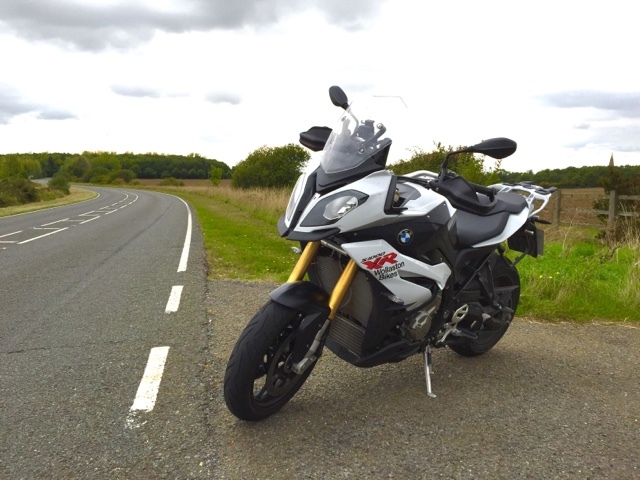 As a demonstrator it was fully loaded with all the gadgets the modern, monied motorcyclist has come to expect. Of those, I had decided not to play with the quick shifter, but couldn’t quite resist a little go. What a revelation. Opening the throttle and smoothly - ballistically - clicking through the gears without resorting the clutch is glorious fun, even if I found clutchless down shifting so alien I couldn’t force myself to fully engage. It works though. Brilliantly. Cruise control on a bike is an irresistible toy; gliding along a motorway no handed is always fun. As for switchable power and suspension modes, my time with the XR was so limited I couldn’t be bothered. Save to say, with a friend’s warning ringing in my ears, I did not engage “Dynamic’ mode. I’m reliably informed the savagery of power delivery may not be a winter pursuit, despite traction control. In the standard Road mode it is brilliant. Low down, the power is wonderfully even and predictable: good, but hardly mind blowing. The motor apparently puts out 160bhp (at 11000 revs,) which may exceed that of my K1300R, but the torque is not as low down the range. It was enough to get up to speed on the A45 dual carriageway though, indeed, the first time I looked, I was up to 85mph, protection form the screen fooling me into think I was bimbling along. Get the needle beyond 6000 revs and the stubby exhaust begins to howl and the bike takes off. Mine was being run in and limited to 9000rpm and, such was the eagerness of the engine I would find the shift light flashing at me on the exit to every roundabout. Revving this bike is addictive. The engine screams “THRASH ME!”, the first such bike I have ridden and I like it. Like the RR and R both of which use the same four cylinder engine, BMW use chain drive and conventional suspension on the XR. Being used to some of the company’s more quirky suspension arrangements, I was surprised by the lack of dive under hard braking. I loved the handling. From low to high speed the big wide bars provide perfect control rolling into bends precisely and taking you where you looked without fuss. Even a little casual roundabout surfing felt unstressed. For the first time ever, getting back on my K13 was a bit of a come down. Yeah there is prodigious torque, but the bike felt like a flat, fat, low, plank. I’d never realised just how wooden the duolever front end feels and how difficult it makes steering. That’s my excuse, anyway. 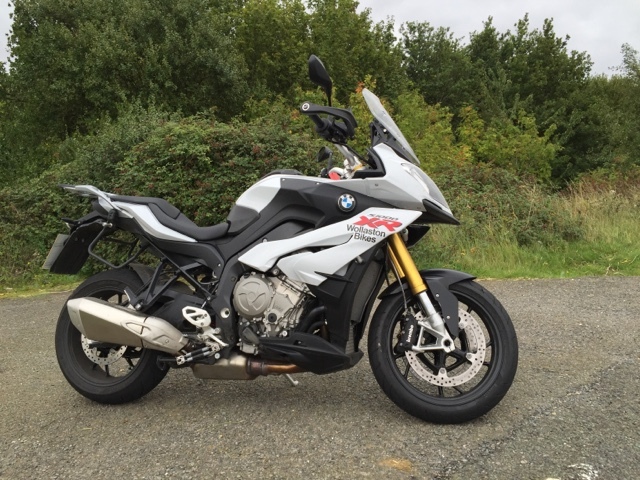 The BMW S1000XR manages to be all things to all men (or women.) It is distinctive yet good looking; comfortable and practical, though lithe and sporty. It is also civilised and simultaneously completely bonkers. I collect mine next week.